Juan Williams is a well known Washington-based writer, journalist and commentator. On NPR, he offered political analysis that mostly suited public radio's appetite for reasonable and contextual political observations. It was when he appeared on Fox News that his tone changed. Williams has a Zelig-like ability. He can sound like NPR when he was on public radio, yet voice Fox-like observations on Fox programs which appealed to the red-meat Fox audiences. He once stated (on Fox) that Michelle Obama's "... got this Stokely Carmichael-in-a designer -dress thing going. If she starts talking . . . her instinct is to start with this blame America, you know, I'm the victim. If that stuff starts to coming out, people will go bananas and she'll go from being the new Jackie O. to being something of an albatross." On NPR, his tone was more measured, largely because Williams knows what his audience will tolerate and more often because his scripts were vetted in advance by NPR producers - something that I suspect may not happen as frequently on Fox. Over the years as NPR's Ombudsman (2000-2006), I received many complaints about Juan's comments on Fox; relatively few about his commentaries on NPR. Management was willing to tolerate Williams on Fox because of a respect for his First Amendment rights - something I think was in fact a deformation of that Amendment, rather than an affirmation, but that's another subject for another posting. The final straw for NPR management occurred yesterday when Williams appeared on Bill O'Reilly's show on Fox. O'Reilly, always the master provocateur asked Williams if he agreed that Muslims caused 9/11. Williams agreed and then went farther: "Look, Bill, I'm not a bigot. You know the kind of books I've written about the civil rights movement in this country. But when I get on the plane, I got to tell you, if I see people who are in Muslim garb and I think, you know, they are identifying themselves first and foremost as Muslims, I get worried. I get nervous." That did it for NPR: Williams was fired after the public broadcaster and the ombuds, Alicia Shepard received hundreds of complaints. With CNN's recent firing of Ric Sanchez and now NPR's firing of Juan Williams, it appears that media organizations are finally stating that there are limits to free speech at least when their corporate reputation is at stake. Robust civic discourse is one thing; bigotry disguised as fair comment is another. Both CNN and NPR showed they can understand the difference. Serendipitously, this could not have happened at a better time for NPR management: just after NPR announced that it did not want its employees to attend the Jon Stewart/Stephen Colbert rally in Washington next weekend (and took considerable flack from liberal bloggers), Juan Williams is fired for his anti-Muslim statements. This has the dual advantage of placating (if such a thing is possible) both conservatives and liberals in this high-charged atmosphere. Sometime, it seems management just gets lucky. Nice commentary, Jeff, but please fix your headline. Oops! Seems the American "mainstream" media ('cept perhaps NPR) doesn't agree with your take on this matter. Witness the lead on most of this evening's "Evening News" broadcasts. I'm confused...please help me figure it out? The problem remains if other NPR journalists are still allowed to express their opinions in non-NPR venues. NPR management still needs to address that. Otherwise it looks as though Juan is being singled out. More to the point: Is Fox a journalistic organization? Yes, even if it relies on opinion more than on fact-based reporting. The BBC insists that its journalists not express personal opinions on matters of public controversy. NPR, as a fact-based news organization has more in common with the BBC tradition than with Fox. But in these times, that may be a difference without a distinction. Wrong on both counts! Respect for his, and Sanchez´s, 1st ammendment rights is EXACTLY THE POINT. And making remarks about human nature like Williams did is now against NPR policy? His reaction to Muslim garb in the imagined airplane is shared by EVERYONE! Suddenly the idea that the plane could be hijacked or blown up becomes very real - the last thing a passenger wants to consider! A discussion that deals with REALITY is sorely needed - attempts to deny human nature by employing PC standards serves NOBODY! If you are interested in an intelligent take on the affair check out the MUSLIM author Asra Nomani on Tell me more Fri 22 October! Your last commentator misses the point. What Williams said was racist. That's why he got fired. And it was just one in a long line of controversial statements by Williams on Fox. What your commentator describes is ethnic profiling and stereotyping. Not everyone believes those are good practices. They are the fundamentals of prejudice. As an NPR executive said, in summary, is NPR did not take away Williams' First Amendment rights. Just look at all of his media appearances in the past week to prove otherwise. What NPR did was take away Williams' ability to get paid to use his rights on NPR. Why should the radio network put up with employing an analyst who uses his past writings as a shield for his own prejudice? And let's remember that NPR has First Amendment rights too. The right to manage its staff, its content, and its trusted "brand." Taking more protective measures to shore up journalistic principles in a time a rapid erosion seems very sensible to me. 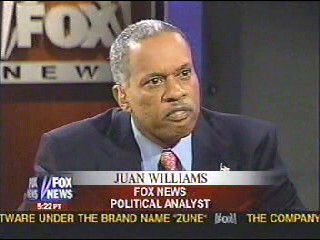 Could you have picked a less flattering picture of Juan Williams?